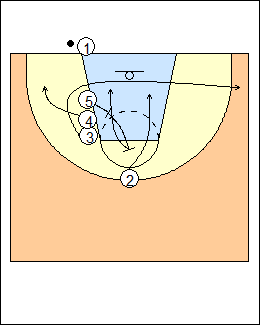 1 inbounds, 5-4-3 stack, 2 is at the top of the key. 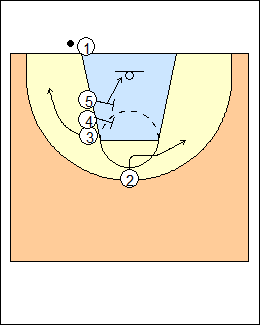 3 curls around 4 and 5 to the weakside corner, as soon as 3 curls around 5, 2 fakes a middle cut and uses a double screen by 4 and 5, who then roll to the basket in opposite directions. 1 comes in opposite a pass to 2. 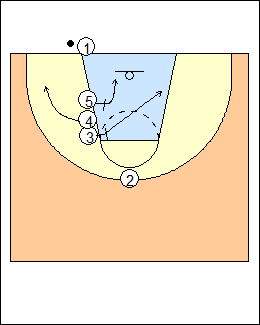 Ballscreen if 2 has no shot. See Inbounds - Baseline Hubie Brown, also Stack 3, Basic stack. After 3 curls, 5 screens for 4, who pops out, then 5 screens for 2 and rolls to the basket. See March Madness (SFA stack high). 4 and 5 screen for 3 who pops out for a pass from 1, 5 rolls to the basket. 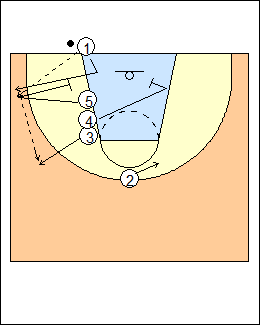 3 and 5 pinch screen for 4 who pops out, then 5 and 3 roll to the basket. 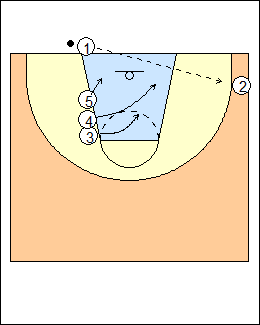 - 3 breaks to the ball, see Basic stack (can be used against man or zone). Against a zone or combination defence, 2 spots up in the weakside corner, 5 and 4 cut into open gaps while 3 cuts to an open area in the middle of the lane. 5-4-3 shrink the zone, allowing a direct pass to 2.